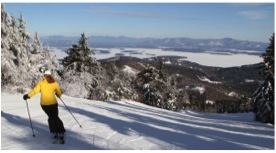 NH Ski Resorts, Inns, Restaurants, Tours, and More - Things to do in the Lakes Region! 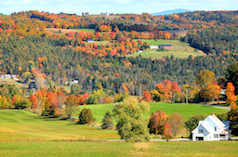 Looking for things to do in New Hampshire and the Lakes Region? These the must the tourist attractions in New Hampshire and a Lakes Region Airport Shuttle can help get you there! Whether winter or summer, there are hundreds of great things to see, places to go, and tours in the Lakes Region, Lincoln, and Wolfeboro. Whether you're visiting from Concord or Boston, here are some great vacation activities in the Lakes Region. 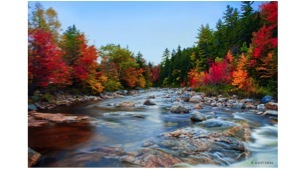 Start your New Hampshire getaway right! Book transportation to or from every tourist attraction in Meredith, Laconia, Wolfeboro, Lake Winnipesaukee, and more. 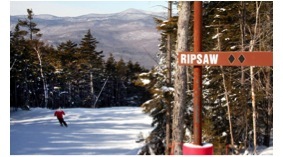 Located in nearby Lincoln NH, Loon's 12 lifts and 61 trails totaling nearly 30 miles long make it one of the most appealing NH ski resorts. 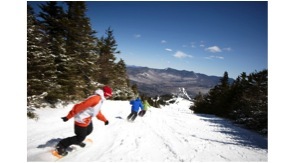 The Loon Mountain Ski Resort is a great way to spend the winter in New Hampshire. Take the gondola to the Summit Cafe for an unbeatable view! Boasting the most lit terrain in New England, Gunstock is a haven for night skiers everywhere. No time to hit the slopes during the day? The mountain doesn't close until 9 or 10, giving you plenty of time to take advantage of all 21 well-lit trails. New Hampshire attractions don't get much better than Waterville: with over 4,000 feet of elevation, glades, mogul fields, high-speed quads, it's everything you could possibly want. But don't take our word for it... visit today and see for yourself what all the buzz is about! The Mountain View Grand Resort & Spa is a first-class travel experience and one of the most luxurious hotels in New Hampshire. 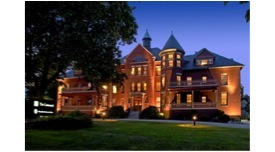 You won't find a more charming hotel than this premier destination resort in nearby Jackson, NH. Adirondack design and farmhouse furniture make for a cozy, comfy vibe. Modern style mixed with historic feel is what sets the Centennial apart from your average hotel. Located in a tranquil setting and next to the innovative Granite restaurant, your time here is sure to be relaxing. 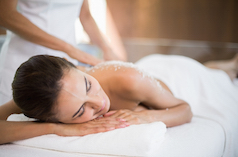 America's oldest summer resort provides you with all the upscale amenities needed to remain stress-free for the duration of your stay. 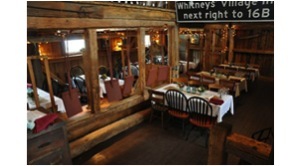 Plentiful dining and shopping options make this a must-try for all visitors to Wolfeboro, NH. You won't find better food or customer service in the Lakes Region than you will at this landmark on the Daniel Webster Highway. Don't forget to take a picture with their sign! This is one of the most unique New Hampshire attractions! With a focus on fun, educational, nature-oriented programs, Prescott Farm offers everything from moonlit snowshoe walks to outdoor winter adventure camps. 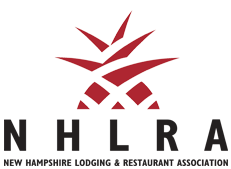 Visit their site today to see everything they have to offer! 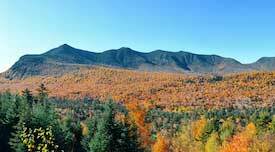 The Kancamagus Highway and the White Mountains as a whole offer a huge variety of beautiful, scenic hiking trails. With no limit to the amount of wilderness you can explore, the only thing stopping you is the amount of daylight! 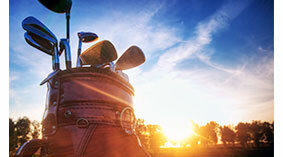 The Lakes Region is home to several word-class golf courses. If you’re headed to New Hampshire for a golf vacation, private & public courses are available in Wolfeboro, Meredith, Moultonborough, and more. The legendary Kingswood Golf Course is located in Wolfeboro, NH. Whether you want to soak up some rays or enjoy some water sports, Lake Winnipesaukee is filled with fun beach destinations. Enjoy a day on the beach, hiking, sailing, and more. 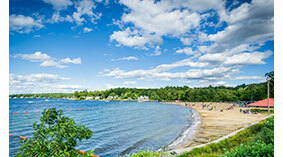 Weirs Beach in Laconia is one of the best-known summer spots. 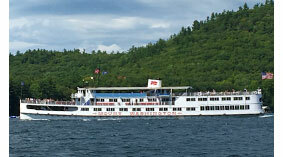 The Weirs not only features sandy beaches, but cruises, arcades, and tons of family activities. The Castle in the Clouds is a castle in Moultonborough open to the public and available for weddings, corporate parties, proms and more. You can explore the castle grounds on your own, gift shop, or art gallery. Visit the castles in New Hampshire and other historical landmarks today. Looking to do some shopping in the Lakes Region? The Mill Falls Marketplace is a tourist treat with 11 stores and 8 restaurants, all surrounding a 40-foot waterfall. The region also features several great farmstands and markets for great produce and local foods. Take a boat ride on The Mt. Washington around Lake Winnipesaukee. The Mt. Washington was originally a Victorian style steamship renovated with diesel engines. The Mt. Washington offers scenic cruises out of the Weirs and Alton Bay. 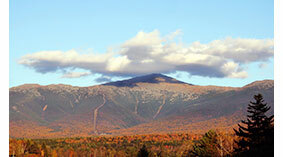 Headed to Mount Washington? Take a scenic route up New England's highest peak on the cog railway. 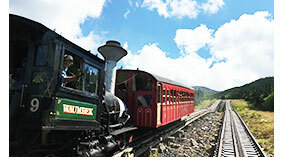 Open from late April through October, the mountain train has been in operation since 1868. Not in the mood to ski or head to the lake? For something educational, there are a number of museums including The Remick Country Doctor Museum and Farm. 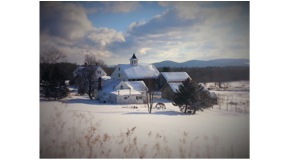 Located in Tamworth, NH, the The Remick Country Doctor Museum & Farm preserves the past to educate the future! 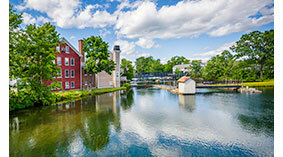 Mill Falls at the Lake is one of New Hampshire's best resorts and spas on Lake Winnipesaukee. The resort features four hotels, five restaurants, plenty of shopping, Lake Activity Center, and the Cascade Spa. When the lake freezes over, the fun doesn’t have to stop, in fact, that’s when the fun really starts. 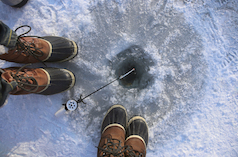 Check out the best ice fishing and ice racing sports in Meredith and Moultonborough.